Superior noise reduction: Achieve amazing, natural-looking results from your high ISO images with all-new state-of-the-art noise reduction technology. 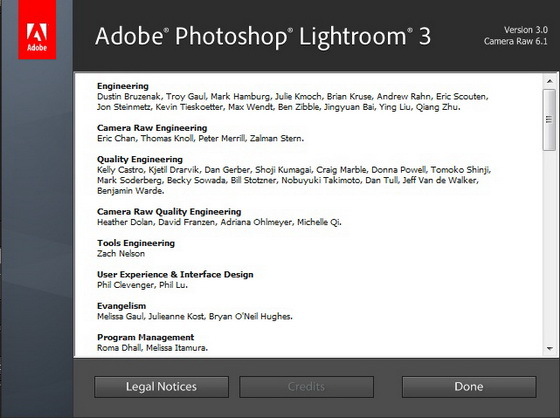 You won't need more than what's built into Adobe Photoshop Lightroom 3 to get the cleanest images at any ISO. Lens correction: Quickly and easily perfect your images by automatically reducing lens defects like geometric distortion, chromatic aberration, and vignetting with single-click profiles. Even images from the best lenses will be improved. Accelerated performance: Get your digital photography tasks done fast and have more time to shoot and promote your work. Already quick performance has been dramatically accelerated in Lightroom 3, saving you time from first look to final image. Support for DSLR video files: Take advantage of new support for video files from most digital SLR cameras, which allows you to easily manage and organize both still photographs and video files side by side. Image watermarking: Easily embed your identity or your brand and logo in your images with more options for customizing their look. The new watermarking tool lets you apply text or graphic watermarks to a photo with adjustable size, position, and opacity. Easy-to-share slide show videos with music: Show your images to clients, friends, or family with more style and flair using elegant slide shows with music. Slide shows are a breeze to create, and you can share them easily by exporting them as videos, even in high definition. Tethered shooting: Instantly import and view images as you shoot them with tethered capture, available for select cameras. Use it to make an immediate, highly detailed check of your shot, the lighting, or the shooting setup. Or get instant feedback from clients or subjects. Easy image importing: Save time with fast image importing. The newly designed import interface is easy to set up and navigate, with clear visual indications of where your photos will be located and how they'll be organized after you've imported them. Perspective correction: Get more natural-looking results by applying powerful, nondestructive perspective correction to your images. Reduce or eliminate the distortion that can occur, for example, when you take a photograph with the camera pointed upward, causing buildings to appear to be leaning backward in your image. Film grain simulation: Use new sliders to easily control the amount, size, and roughness of grain that you can add to your images to simulate the look of film. More flexible print packages: Showcase your work in more creative formats using highly customizable print layouts, which you can save as reusable templates. With the new custom print layout creation tool, you just drag one image or several shots onto a page and resize or reposition them as you like.